OSWEGO – Fitzhugh Park Elementary School’s third annual Career Day attracted dozens of community partners and hundreds of FPS students eager to learn about local job opportunities. 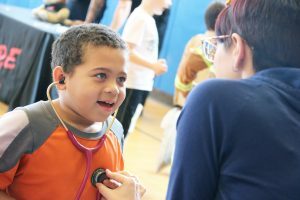 Fourth grader Jordan Kelley is wowed by the sound of his own heartbeat, as he tries out a stethoscope at the nursing table with the help of licensed practical nurse Emilie Losurdo, who volunteered at the event from Dr. Padma Ram’s local medical office. FPS third grade teacher Mary Kate Dehm, who co-organized the event with fourth grade teacher Erin Sabatini, said the annual event perfectly coincided with the Oswego City School District’s vision to lead students to become fully prepared and life ready. Career Day, Sabatini said, was important for all FPS students who had become exposed to careers outside of what they know. Dozens of local community agencies and partners, who had utilized opportunities with trade organizations, various levels of college or other workforce connections, participated in the day’s career tour in the gymnasium. FPS’ own special area teachers, city of Oswego Mayor Billy Barlow, a restaurant owner, nurse and business owner, among other professionals, offered advice, freebies and encouragement to each student. Dressed up in a homemade chef’s apron, fourth grader Kylie Whitford said she enjoyed talking about culinary creations and hoped to explore the possibility of becoming a chef someday. Several of her peers also dressed up, including as a law enforcement officer, firefighter, business woman and military member. Sabatini said as part of Career Day, her students also worked on writing an essay about their top career choice, while several FPS students reviewed mock interviews to determine which ones were successful, who could point the timid interviewee, and which of the 7 Habits of Effective Kids would most benefit students in future interviews. Various classroom activities were also held for students in younger grades.